Let’s get this out of the way right now: if you’re reading this and you haven’t played the first Trails of Cold Steel, please do that before continuing. There’s value in this game, but its primary purpose is the continuation of its predecessor’s tale, and starting here is not advised. Okay, now that we have that taken care of: let’s do this thing. While the first Cold Steel implemented a Persona-like school setting for its adventure, its sequel follows its climactic events and builds a more generic, Tales-style fantasy war adventure. 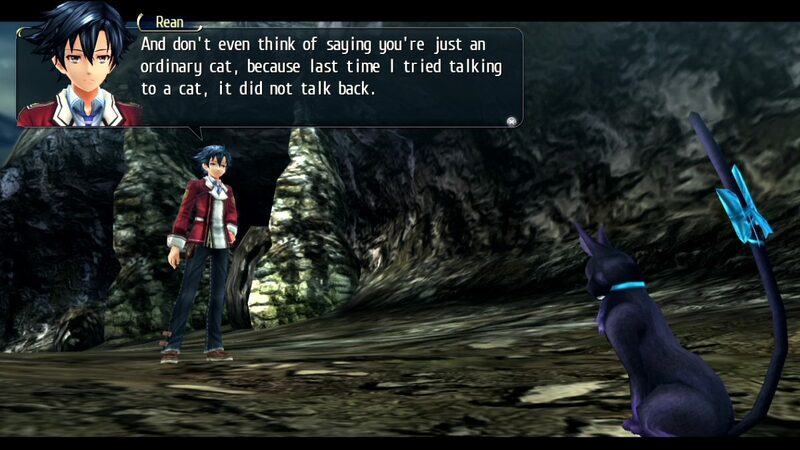 Trails of Cold Steel II sets this tone early, jumping right into magical talking cats in the very first scene. It’s possible that Falcom thought that players already experienced a school tale and would want something different? Even still, there are vestigial elements like “class rank” that make less sense here but are needed for the game’s structure. While the first Cold Steel implemented a Persona-like school setting for its adventure, its sequel follows its climactic events and builds a more generic, Tales-style fantasy war adventure. One good part of this change is how Cold Steel II‘s geographically contiguous structure actually feels fresh. Since the first game had you hopping around on trains and exploring areas out of sequence, this adherence to ground paths means you learn more about the world and encounter towns in a very different sequence. There’s a constant dance between nurturing familiarity and subverting expectations, reminding you of your old adventures and portraying a world amid upheaval. The game makes the odd choice of reintroducing everyone, creating odd moments when people you very clearly remember from the first game are labeled with generic titles. It even makes you question your own memory when it does it. “That’s Elliot’s dad, right? We totally met him already. I think. Unless it isn’t. But it is?” You’ll walk through the same areas stitched together by new ones, and the premise — that the railways are taken over for the war and that you need to stay inconspicuous — is a solid enough line of reasoning for this change of transit. What doesn’t work so well is how the moment-to-moment gameplay addresses your hunted status. 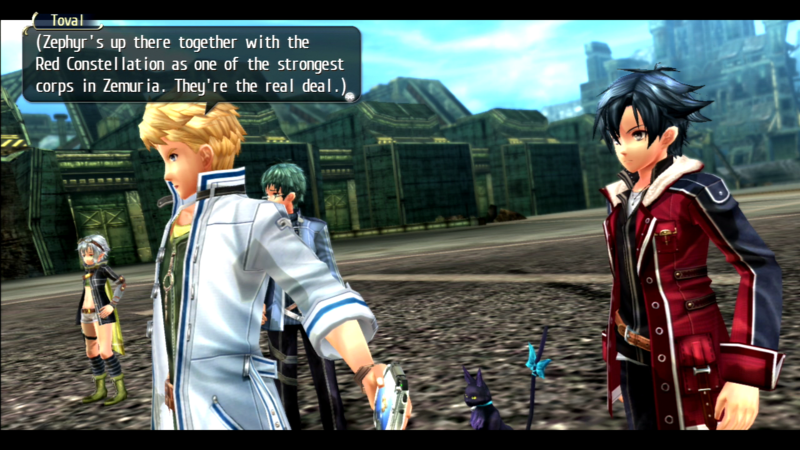 Trails of Cold Steel II doesn’t hesitate to remind you that you need to stay out of sight and not be noticed, but you conspicuously interact with almost everyone everywhere you go, and in attire that really doesn’t obscure your identity. Suspending disbelief will be necessary to enjoy this one. 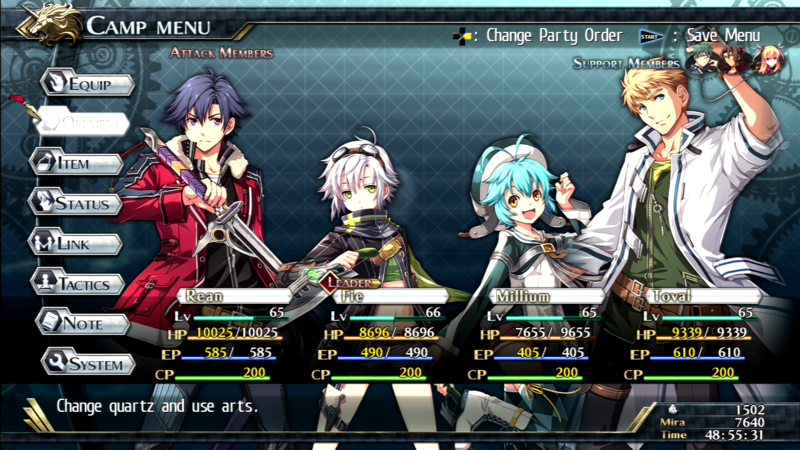 In the first Cold Steel, you could have maxed out your characters’ capabilities… or not. In this release, your level isn’t totally reset at the beginning of the game, but you’ll likely drop a few from your previous total; characters start at Level 40 and work from there. That also means your characters’ low-tier battle effects are already earned, and the focus is on enhancing links and such rather than simply building them. This leaves room for you to get stronger again, picking a spot between total ability wipe and a steep ramp that starts at already-stratospheric heights. 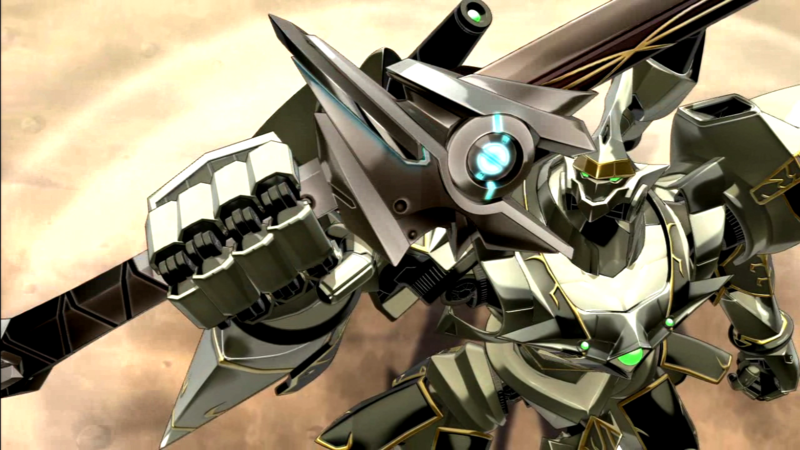 What doesn’t disappear or dissipate is Rean’s connection to his large armored knight. Trails II has its fair share of set-piece mech battles, similar in many ways to standard combat but with a more streamlined, rock-paper-scissors feel. Just like the rest of the game, there are opportunities to get stronger beforehand and use elemental weaknesses and the bonds of friendship to tilt the odds in your favor. Falcom does a good job of recognizing that this isn’t a more fun thing to do than the game’s actual fighting system, so it uses it sparingly and pairs it with normal combat in many key moments. Your characters’ low-tier battle effects are already earned, and the focus is on enhancing links and such rather than simply building them. You can transfer your save file from the first Cold Steel, as may generally be expected these days. It’s not a huge bonus — just some boosts to get you started and a few bonus conversations — but Falcom makes it phenomenally easy to use, even allowing you to cross-save your old game’s save if you’re switching platforms. The main menu offers a full story summary for the first release, including all plot points and even some materials that existed outside of the game itself. This isn’t really suited for new players, because there’s really no reason to jump into this second one without playing the first, but it is useful for reminding yourself of the particulars if it’s been months since you wrapped your playthrough. 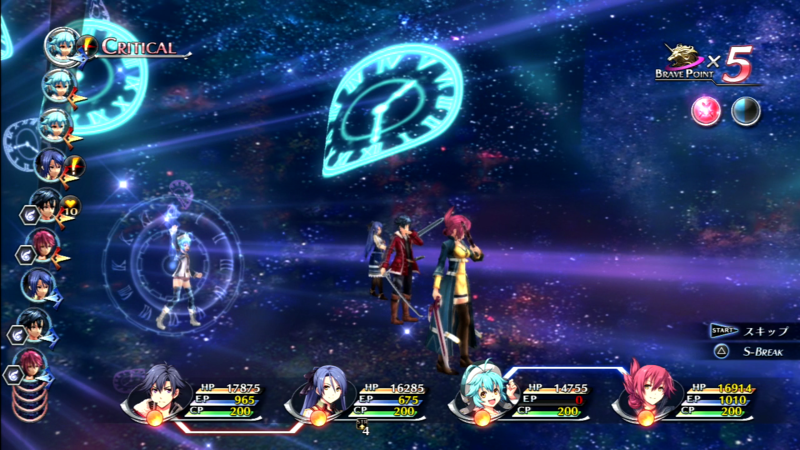 Trails of Cold Steel II is not a visually impressive game in 2016, especially on the large screens of the PS3 edition. The Vita seems to be the lead platform here, even in its original Japanese release, and a solid art design is held back by muddled, low-resolution textures on environments and lesser characters. These environments, then, look better when they’re crowded: think lively towns and inhabited rooms rather than the desolate corridors of battle that will fill most of your time. The visuals, as well as the audio, are largely recycled from the first installment, and that seems like exactly what Falcom set out to do: reuse its work and world to make another sprawling quest with a much smaller turnaround. As such, you’d in many ways be forgiven for thinking that Trails of Cold Steel II is really more of Trails of Cold Steel, Disc 2. It’s a fair development choice, but it’s good to have that mindset when heading in. In a way, Cold Steel II almost feels more special for being released out of its own time, an adventure that may have gotten lost in the shuffle but gains a moment in the spotlight by waiting years for its entrance. It’s full of tropes and genre conventions, and as the “middle tier” of console JRPGs becomes harder to find between big-budget Final Fantasy and quick-and-dirty anime-style dungeon crawlers, its presence in that space makes it stand out. 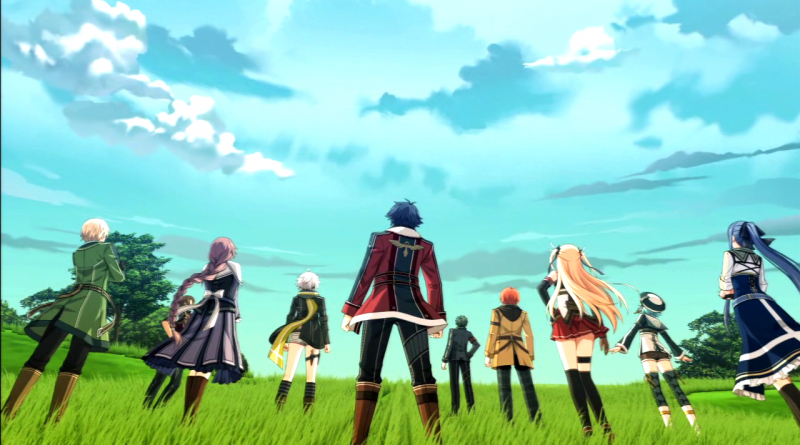 Unless your primary interest in the first game was its school-based antics, you’ll want to continue with Trails of Cold Steel II, and it keeps delivering the world-building and tactical combat that made the original so compelling. Pick it up on either platform and say goodbye to another hefty chunk of your free time.